One of the most successful areas of the open source geospatial movement is providing data access APIs and data providers for a wide range of file formats. For example MapServer users are familiar with OGR and GDAL. Frank Warmerdam has been a leader in this area. His data providers are widely used in both closed and open source geospatial projects and products. Since MapServer is primarily focussed on web publishing, OGR and GDAL are basically read-only APIs and are optimized for query applications. The Feature Data Object (FDO) API is a new kid on the block. It is distinguished from OGR and GDAL in that it provides a full edit API including among other things support for transactions, locks, and versions. In a previous blog I emphasized that MapGuide Open Source provides a Web 2.0 platform because it is designed to provide full update access to geospatial (and non geospatial) data. Autodesk contributed FDO and several FDO data providers to OSGEO.ORG. FDO is getting a lot of interest at the OSGEO site. For example, there are now OGR and GDAL data providers provided by Traian Stanev and Frank Warmerdam, respectively. A PostGIS data provider is in the works. In the last few days Haris Kurtagic has created an open source project on OSGEO to support an open source Oracle data provider. Haris has told me that he is seeing a tremendous amount of interest in his data provider. If you want an interesting perspective on FDO, take a look at Jason Birch's most recent blog (Jason Birch on FDO ). I've been carrying an OQO Model 01+ with a USB GPS around with me on airplanes, hiking, and cross-country skiing for over a year and if there is one thing that has been the single biggest problem, it is battery life. I have seen the same comment in reviews of the Sony Micro PC as well so I don't think this is just an OQO issue. (Incidentally these devices are being referred to as UMPC Pro devices to distinguish them from consumer UMPC devices from ASUS, Samsung, and others.) Recently OQO released a larger battery which is designed to allow you to run your OQO for 6 hours. In my opinion battery life is usually defined by the marketing department so I took my OQO with a USB GPS (which uses the OQO's power) and the larger battery on a 7 hr hike this weekend. I turned the OQO on at 9am and it automatically hibernated at 15:15. Very impressive. I have heard from authoritative sources, that as components become less power hungry and battery technology improves, all day UMPCs will become the norm, which is something to look forward to. Autodesk has just announced the certification by the Open Geospatial Consortium (OGC) of Autodesk MapGuide Enterprise 2007 for its WMS 1.1.1 implementation. "This product complies with the OpenGIS® Web Map Service, Revision 1.1.1, (WMS 1.1.1). OGC, OpenGIS®, and CERTIFIED OGC COMPLIANT are trademarks or registered trademarks of Open Geospatial Consortium, Inc. in the United States and in other countries." Everybody interested in creating open and interoperable systems. Traditionally, GIS has been isolated by its own proprietary data-formats. The last few years have seen a tremendous momentum in the area of standardization and the OGC has spearheaded this initiative in the geospatial arena. For those of you who are durian fans, my colleague Keshav Sahoo has provided some advice in the care and handling of durians. Regarding the odor, the trick is to throw away the outer, spiky layer before it gets too ripe (rotten). The seeds (almost three times the size of a cashew) are also excellent roasted. You can make an excellent curry out of young, green durians. I also found durian chips in a store in Thailand. There are salty and sweet varieties and people in Ottawa who have tried them have found them quite tasty. Last Friday I was fortunate to attend several very interesting presentations at MapAsia 2006 in Bangkok. Among them was a presentation by Abdul Ghapar Othman and Kausar Hj Ali from the School of Housing, Building and Planning, Universiti Sains Malaysia, Penang, Malaysia about PEGIS, which is a GIS developed by the government of Penang State. To me it was interesting because Mr. Othman outlined a fairly typical evolution from an expensive, complex GIS requiring high end work stations and experts and focussed on producing printed maps to a modern web-based geospatial server that anyone with a web browser can use for manipulating geospatial information. 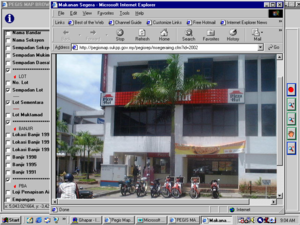 PEGIS was established in 1992 and was the first statewide GIS in Malaysia. It started as a two-year pilot project, and was designed to address issues arising from land scarcity, rapid land development, and increasing demand for land related data from the public and private sectors. The objectives were to increase the efficiency and effectiveness of data management, develop an automated tool for spatial database development and the dissemination of data and to translate various social, economic and infrastructure plans into action plans, and to improve the decision making process. It started as a two-years pilot project managed by the ECS Consortium and Universiti Sains Malaysia. The study area consisted of some 74 sq km on the mainland, for which over 30,000 land parcels were digitized. Access to the the PEGIS database was restricted to government agencies. It contained information such as cadastral map/cadastral sheet index, land use, vegetation, soil types, hydrography, zoning, demographics, but also infrastructure including electricity, telecommunication, transportation, sewer, and water networks and buildings. The implementation was a traditional GIS using ArcInfo on HP workstations running HP-UX with peripherals such as digitizers and electrostatic plotters. By the end of 1994, the project was successfully implemented and handed over to the Penang State Government. The key success factors were strong support from the State Administrator and good cooperation among government agencies. In the succeeding years 1994-1999, the project was extended to include all of Penang State. The database for the entire state was completed in 1999. It is interesting that the concept of centralized data was not favored by most data providers, and data providers continued to create, maintain and populate their own data. Although PEGIS was successful in achieving its immediate goals, several issues became apparent. First, users had to come to the PEGIS Centre which severely restricted access to PEGIS. Secondly, data dissemination was in the form of hard-copy maps only and printing costs were substantial, US$14 per A0 map just for ink and paper not including labour costs. Map preparation using Arcplot-UX was not user friendly so the people who could use the system productively was restricted. The process for requesting maps was highly bureaucratic. In addition, PEGIS staff often had to work under intense pressure to respond to requests from the state legislature that bypassed the standard map request procedure. The cost of setting up a "GIS terminal" was high, starting at US$30,000 for a PC, A0 color plotter, A0 digitizer and GIS software. It cost more if networked with the PEGIS database (UNIX OS). This was a severe financial limitation for most local governments. Another problem was the limited awareness and understanding among government officers of GIS. As was typical of Unix-based GIS's at the time ArcInfo-UX was not user friendly which meant that it was difficult for a non-GIS educated user to grasp, so in essence it required a GIS professional. The Penang State Government began adopting Internet access in 1997. Network and computer infrastructures and computer facilities were upgraded and by year 2000, all government agencies were equipped with Internet lines. 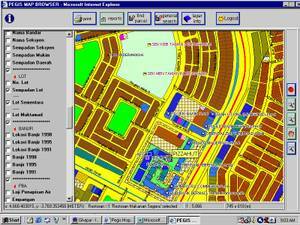 By 1999 a web mapping application (using Autodesk MapGuide) had been developed and launched. In a nutshell the advantages of web mapping were several; it provided users with low cost access to the PEGIS database, it was accessible to any user with Internet access, and it took less than 15 minutes for users to become familiar with the application. Web mapping solved major problems that had been identified with the traditional approach to GIS. First of all, users didn't need to be GIS professionals familiar with how to use a traditional GIS. They simply needed to be familiar with the operation of a web browser. Secondly, they didn't need to come to the PEGIS Centre, all that was required was Internet access. Thirdly, printing costs were dramatically less. In fact, users often didn't even need to produce paper maps. The cost of setting up a "GIS terminal" were reduced to the cost of simply setting up a PC with a web browser and Internet access. From the perspective of improving government efficiency, web mapping has meant that the cumbersome bureaucratic procedures for requesting maps were no longer required. Finally and perhaps most importantly from the perspective of improving governance, web mapping has broadening access to the PEGIS to include the public. Although initially it was targetted on internal government users, web mapping turned out to be so successful in enabling users with no IT or GIS skills to manipulate PEGIS data , that limited access for the public has now been implemented. In summary, web mapping has meant that the number of users who have access to PEGIS data has been dramatically broadened, the cost of providing access to PEGIS data has been reduced, and a foundation has been built for open government, for providing transparent access to land data and land management processes. 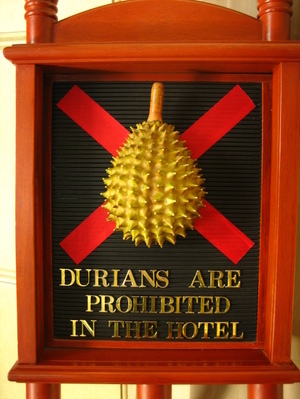 I promised some of my friends back in Ottawa to return from Bangkok with a "no durians" sign. Here it is. For those of you not familiar with durians, they're a large, spikey fruit that you can find in Thailand and other countries in Southeast Asia. I have had durian candy, ice cream, and summer drinks and I liked them. The flavour is unique and unlike anything else. They also have another unique characteristic which is that the outer skin emits an absolutely foul odor, so bad that they are banned in many public places, hence the sign. Durians are like anchovies, you either love them or hate them, there is no middle ground. Several years ago I brought back some durian candy from Southeast Asia for my colleagues in Ottawa. Some never forgave me and to this day refuse to accept candy from me, no matter where it is from. I think they are really missing out. When I returned from Malaysia last time I brought back some "pepper candy", which is made from white pepper corns. I found it absolutely delicious as did the people who are still willing to risk accepting candy from me. Mike McGill from Digital Globe gave a very interesting and germane presentation at MapAsia 2006. If you are not familiar with Digital Globe, they are the folks who are responsible for the Quickbird digital imaging satellite and the the soon to come Worldview satellite. Mike described the dramatic increase in demand for high resolution digital imagery. He ascribed a lot of the demand to Google Maps' support for the "hybrid" view, in which you can see both standard vector-based road/street maps and imagery. It seems people just love to be able to zoom down to see a digital image of their house. High resolution implies much higher data volumes, and since imagery is available for most of the world we are talking about huge data volumes. At a recent conference it was suggested that we are currently collecting a terabyte of data per day, but other folks suggested that that may be the minimum. The bottom line is that the cost of data per square kilometer is decreasing while at the same time content is going up as resolution improves. The other thing that is happening is that the resolution is getting so high that it will soon be impinging on individual privacy. We will soon need "privacy processing" to smudge out recognizable personal features like faces in high resolution imagery.